One of four ponds built in the 1990s to store water on the Maroon Creek Club golf course, on Dec. 5, 2016. The private club is seeking confirmation of its claimed refill rights for the ponds, which has drawn interest from the City of Aspen and the CWCB. A map showing the location of four ponds on the Maroon Creek Club’s golf course for which the club is seeking refill rights. The ponds are located between Maroon Creek and Buttermilk Mountain. 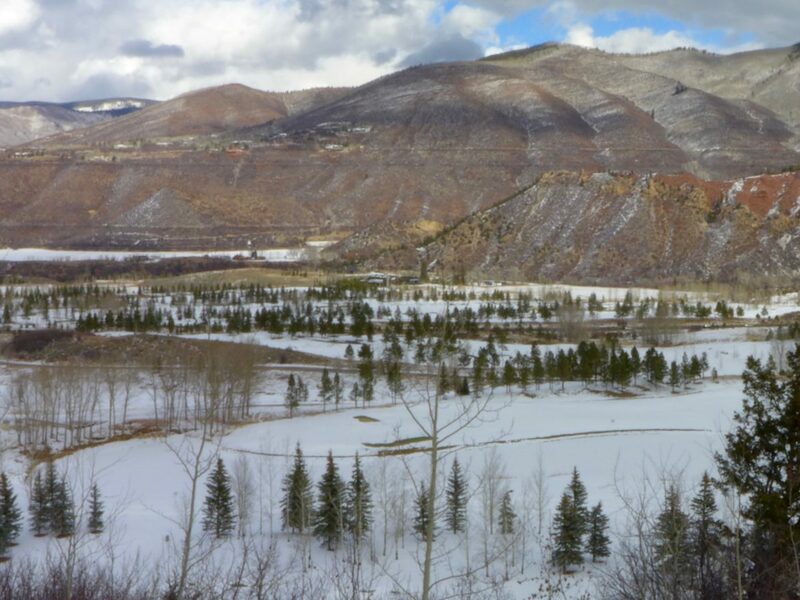 ASPEN – The Colorado Water Conservation Board and the city of Aspen are objecting to an effort by the Maroon Creek Club to broaden a 1989 water right so it can refill four ponds on its private golf course as it sees fit. Both the CWCB and the city have filed statements of opposition in the water court case, which was filed in Division 5 Water Court on Aug. 10. 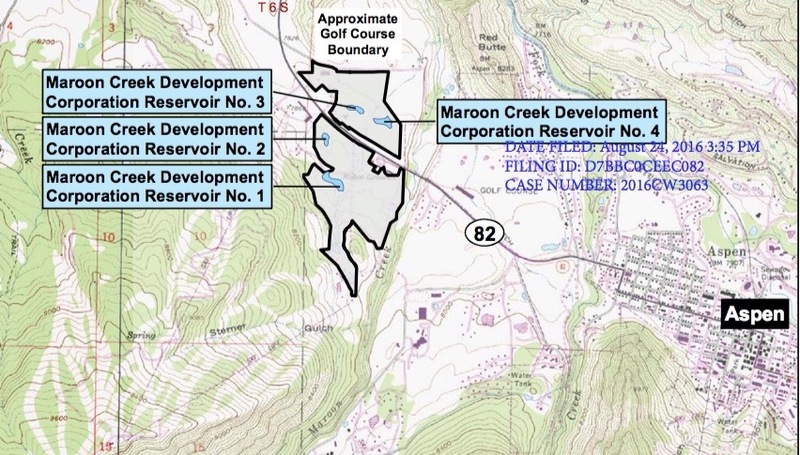 Maroon Creek LLC has told the court it is not asking to expand the 1989 water right, but is instead seeking “determination of surface water rights” regarding potential refill rights for four ponds, arguing that the 1989 right includes a refill option. The ponds are usually filled once a year with water diverted from Maroon and Willow creeks, via the Willow Creek Ditch and the Herrick Ditch under the club’s 1989 water right. But both the state and the city are concerned that in seeking such a determination, the club will actually expand its water right, and do so despite an earlier settlement agreement that sets a cap on the amount of water that the ponds can store in a year. The four ponds can hold between 4.7 acre-feet to 13.6 acre-feet of water and altogether can store 35.1 acre-feet. Two of the ponds are on the Buttermilk Mountain side of Highway 82 and two are on the clubhouse, or north, side of the highway. The ponds were built in the 1990s when the club’s golf course was shaped by a fleet of earthmovers. Overall flow into the ponds, per the club’s 1989 water right decree, is not to exceed 4 cubic feet per second at any one time from the two irrigation ditches that feed them. The Willow Creek Ditch can divert 10 cfs from Willow Creek, a tributary of Maroon Creek that enters at T-Lazy-7 Ranch. And the Herrick Ditch can divert 60.86 cfs from Maroon Creek, which is a tributary of the Roaring Fork River. Attorneys with Garfield and Hecht in Glenwood Springs prepared the water court filing. And Andrew Hecht, a founder of and a partner in Garfield and Hecht in Aspen, is the manager of Maroon Creek LLC. Looking over the Maroon Creek Club golf course from Tiehack on Dec. 5, 2016. One of four ponds on the course is visible, barely, in the foreground. The Colorado Water Conservation Board, which owns instream flow rights in Maroon Creek and the Roaring Fork and Colorado rivers, filed a detailed statement of opposition in the case on Oct. 27. 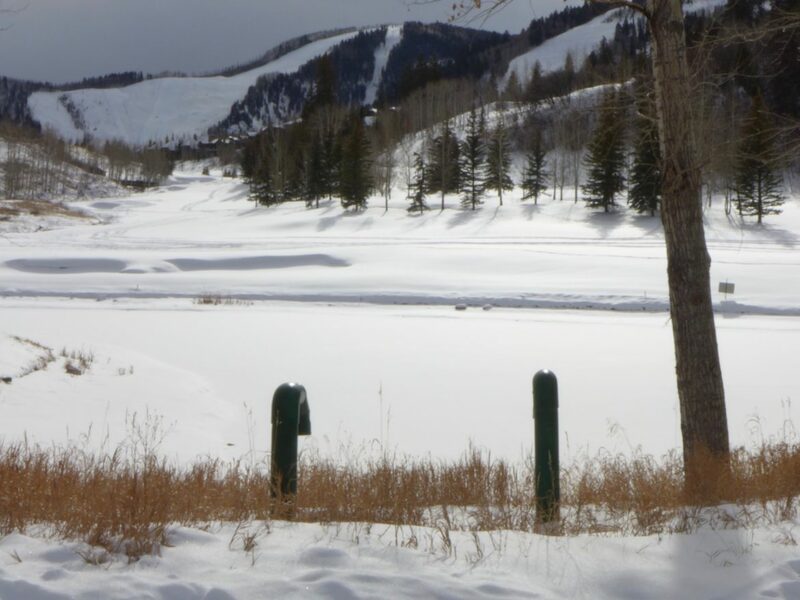 The CWCB argues that the 1989 water rights held by the Maroon Creek Club were the result of a stipulated agreement in the water court case that created the rights, and as such are explicitly limited to a single fill of each of the four reservoirs. “The decree unambiguously awards a single fill,” the CWCB says. The CWCB holds instream flow rights on Maroon Creek and on the Roaring Fork and Colorado rivers. Water attorneys for the city of Aspen also filed a statement of opposition in the case. “Aspen owns numerous water rights decreed for diversion from Maroon Creek and the Roaring Fork River and its tributaries, including certain water rights that Applicant [Maroon Creek LLC] has contracted for use on the property that is the subject of this application, which may be injured by the requested determination of surface water rights,” the city told the court. As such, the city says Maroon Creek LLC “must prove that the request for determination of surface water rights does not create a new water right or expand the decreed amount of use of the water rights” from the 1989 decree. A status conference in the case is set for Dec. 22. Editor’s note: Aspen Journalism and the Aspen Daily News are collaborating on coverage of water and rivers. The Daily News published this story on Monday, Dec. 6, 2016.